Catalog > Vintage Repro Ginny Clothing Pack "Sunsuit"
Vintage Clothing Packs & Accessories Collection SUNSUIT from the Vintage Ginny Clothing Packs #9VCP26. 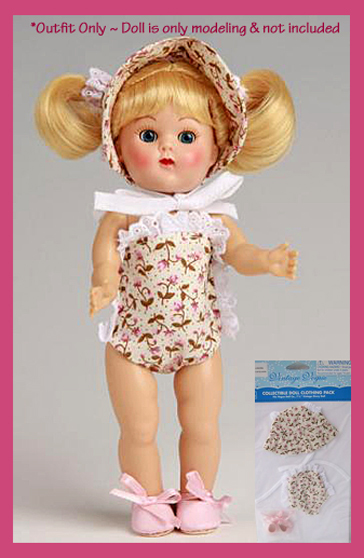 Darling cotton sun-suit with floral print and lace trims, matching sun bonnet/hat and pink slip-in vinyl shoes. Designed for Vintage Ginny and Reproduction Vintage Ginny dolls - 7 1/2 inches tall. Note: Will not fit modern 8" Ginny doll. This doll outfit is new and mint in its sealed package.